The European Union and Canada has signed a free trade agreement that aims to generate jobs and growth though it must still clear some 40 national and regional parliaments in Europe in the coming years to enter fully into force. Canadian Prime Minister Justin Trudeau signed the treaty along with the heads of EU institutions, a step that should enable a provisional implementation of the pact early in 2017, with the removal of most import duties. Minister for Foreign Affairs Charlie Flanagan has welcomed the deal, claiming it is "in the best interests of Ireland, the EU and Canada." Mr Flanagan said Irish trade with Canada is worth in excess of €2.75 billion annually and this deal gives considerable potential to increase this. The Comprehensive Economic and Trade Agreement's passage has not been smooth. French-speakers in southern Belgium, a minority within their own small country and accounting for less than 1% of the 508 million EU consumers likely to be affected by CETA, raised objections that held up the deal until a breakthrough on Thursday, confirmed by regional parliamentary votes on Friday. "All's well that ends well," said European Commission President Jean-Claude Juncker. "We have 20 ongoing negotiations and today we are fixing the global standards the European Union and the European Commission want others to accept." 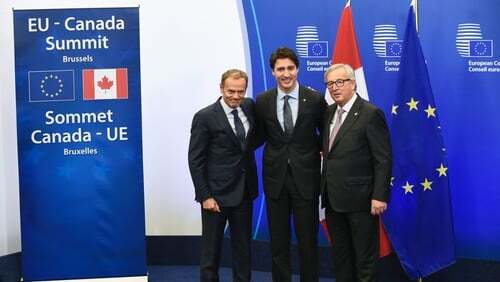 The Canada agreement is seen as a springboard to a larger EU deal with the United States, known as the Transatlantic Trade and Investment Treaty, which has been the target of labour unions and environmental and other protest groups. EU Trade Commissioner Cecilia Malmstrom said TTIP talks were not dead, contrary to what some politicians in Germany and France have said, but would need to wait for the next US president – taking office in January – to resume. Supporters say CETA will increase Canadian-EU trade by 20% and boost the EU economy by €12 billion a year and Canada's by C$12 billion. For Canada the deal is important to reduce its reliance on the neighbouring United States as an export market. For the EU, it is a first trade pact with a G7 country and a success plucked from the jaws of defeat at a time when the bloc's credibility has taken a beating from Britain's vote in June to leave after 43 years of membership. "This has been a very long process. A huge majority of people in Europe are in favour of Europe, but there are concerns and we need to engage with them," Ms Malmstrom said. "The Commission cannot do that alone." Some 100 anti-globalisation protesters clashed with police outside the venue in Brussels, trying to break down barriers in front of the main entrance and hurling red paint. A Reuters photographer saw police detain some people.